I can't think of anything worse than when your child is sick and you have that gut feeling, that so-called mother's instinct, that something is not right. What started out as a little tummy ache quickly turned to a headache and feeling dizzy. Then came the throw-up. Lots of it! Very pale, disoriented, lethargic. Yes, it's time to go to the emergency room. Once at the hospital, Dylan is put into a wheelchair because he is so weak. And quite frankly, too heavy for me to carry. After explaining all of his symptoms to the doctor, he rules out the flu, meningitis, and any problems with Dylan's appendix. Now it's time to draw blood and see what we are missing. Oh no, the thought of this procedure makes my heart break. Dylan has no idea what is coming. 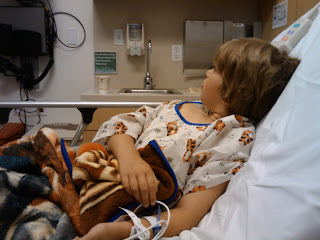 At first we were told to keep him awake, but nothing happens quickly in the ER and he fell asleep. After all, it was now 10 pm. The nurse wants to wake him and I advise her not to. Better to just get it over with. Oh my ... the screams ... "help me, help me" ... I couldn't take it anymore and had to leave the room. Thank goodness for Grandma's! 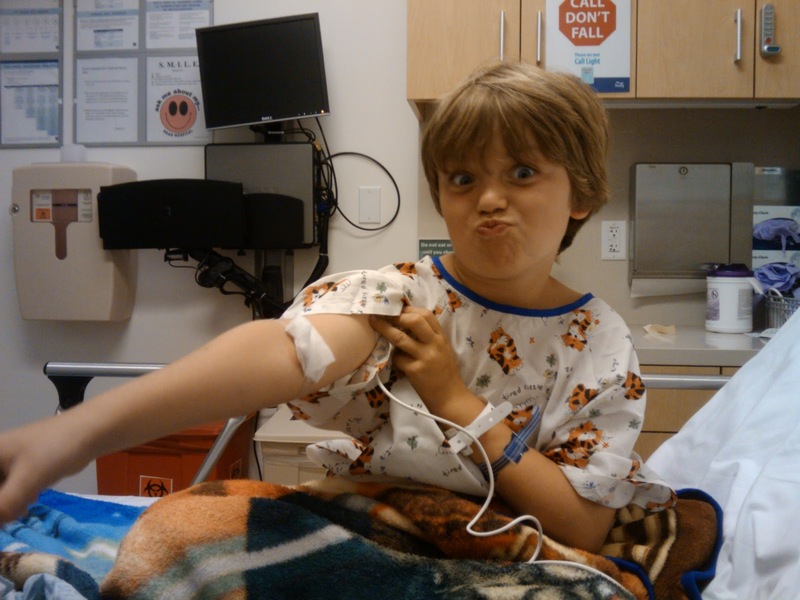 After waiting almost 2 hours for the results from the blood test, all that was determined was that Dylan was dehydrated, white blood count was high, and no bacterial infection was detected. It's viral and must run its course. Dylan was given medication to stop the vomiting and Tylenol for the pain. Around 1am Dylan wakes up and starts talking. Asking if we can go home. Suddenly he seems normal. Telling jokes, acting silly and asking animal trivia questions. He even let me take a video of him. Although he seemed better, we were not out of the woods yet. He pretty much sat on the couch the whole next day and didn't eat or drink anything until late afternoon. As hard as I tried, he wouldn't even drink water. Then he crashed out at 6 pm ... not to wake until 12:30 am. Since I wasn't going to sleep much anyway, I moved him into my bed for the night. He looks at me and says, "I'm better" and gives me a hug. Thanking me for taking care of him. My Dylan was back and I couldn't be happier. poor Dylan and poor mama! So glad he is back to normal. How scary!